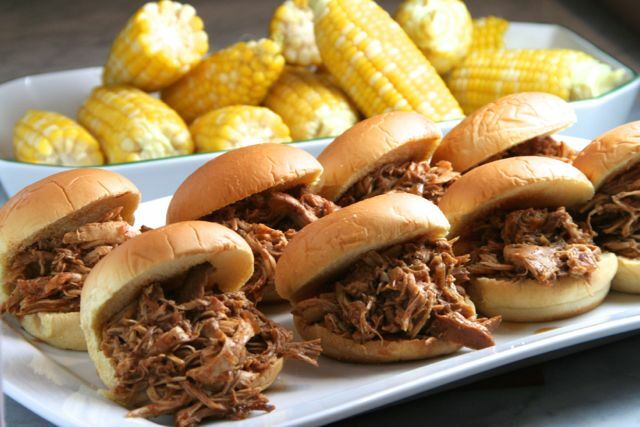 I can’t believe it, but I am tired of pulled pork. What is even more surprising is that my husband is in agreement! This was a nice variation and the sauce was tasty with a subtle spicy kick; I omitted the liquid smoke as I am not partial to smoky flavor. The chicken was really moist even after five hours in the slow-cooker too. This recipe was adapted from Cook’s Country Magazine, via cookingwithauntjuju.com and talkingonmagazines.com. Perfect to feed a crowd. Perfect for guests because it can be made ahead of time and reheated in the slow-cooker prior to serving. We ate it with Provencal Tomatoes and corn on the cob but it may have needed coleslaw and potato salad (too?!?). Next time… 🙂 Nice! Pat chicken dry with paper towels. Generously season with salt and pepper. Combine onion, oil, garlic, chili powders, cayenne, and tomato paste in a microwave-safe bowl and microwave until the onion softens slightly, about 3 minutes. Transfer the onion mixture to the slow-cooker and stir in the ketchup, molasses, mustard, and cider vinegar. Add the chicken to the slow-cooker and toss to combine with sauce. Cover and cook on low for 5 hours, or until chicken shreds easily with a fork. Transfer cooked chicken to a cutting board or rimmed baking sheet and loosely tent with foil. Let rest for 15 minutes. Using a ladle or large spoon, skim the fat off the surface of the sauce. Discard. Stir the hot sauce and liquid smoke (if using) into the sauce. Cover to keep warm. Remove and discard chicken breast skin and bones. Coarsely shred the breast meat using 2 forks. Roughly chop the thigh meat into 1/2-inch chunks. Return the meat to the slow-cooker and combine with sauce. Season with salt and pepper, if necessary. Serve on sandwich rolls with hot sauce to pass at the table, if desired. Wow! I really must invest in a slow cooker. Since in Italy we don’t have pulled pork, I’ve start appreciated it when I moved to Canada 2 years ago. In few words I’m not bored yet, but your version with chicken sound amazing and a super valid alternative, thanks for sharing! I guess the pulled chicken would be too dry with only chicken breasts, huh? I guess you could used a whole chicken as well. Thanks for the inspiration! I’m definitely going to try this! Aunt Juju (one of the inspirations for this recipe) used only chicken breasts actually! I prefer thighs and increased the number of thighs in the dish. I think that a combination probably results in the most flavor & moisture. Let me know when you try it!! I dont like the taste of pulled pork at all, so this sounds like a perfect option for me 😀 Thanks for sharing! I just looked at all 3 recipes and there are slight differences which is fun to compare as to our tastes. I know thighs add more flavor but I do not care for them at all. – probably could not tell in a dish like this! I like your substitution for Frank’s hot sauce and you used Sriracha instead – I will try that next time as I think it could have used more of a “kick”. Thanks for doing this and sharing… 🙂 This is what makes cooking so much fun – sharing, experimenting…! 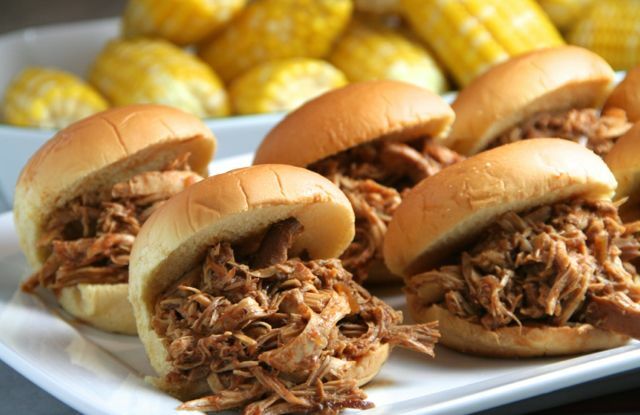 I love this recipe, we eat a lot of pulled pork and pulled chicken all the time. I smoke both the pork and chicken on the grill. My wife does if like you do! The corn looks delicious too! This is a great idea – I too am a little tired of the pulled pork which seems to be EVERYWHERE at the moment – you can’t get a burger in London these days without some pulled pork making its way into the bun – so I am excited to try this! Maybe you can be a trend-setter! We were invited to another delicious summer meal at the brook cooks table!! Lucky us!!! I too love pulled pork, and thought this was a fabulous switch up! Even my children gobbled it down! I don’t eat pork so this works great! Thank you so much for your follow!! We just enjoyed the leftovers of this dish with guests for lunch- super tasty 🙂 Please let me know if you try it!